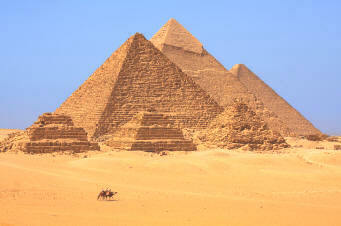 Day 1 CAIRO: Arrive Cairo airport Meet & Assistance at the airport and transfer to hotel Overnight. Day 2 CAIRO/LUXOR: After Breakfast start a city tour visit Egyptian Museum with the largest collection of ancient Egyptian collection in the world including the mummy room (entrance to the room is extra), lunch in Local restaurant and visit Pyramids of Giza and Sphinx. (Cheops, Chephren and Mycerinus), Cheops is the most colossal ever built. Next is a close-up look at the sphinx - a huge funeral complex guarded by the legendary lion body with the face of king Chephren and The Valley Temple. Transfer to the Railway Station for overnight travel to Luxor by sleeper train Dinner on tray on board. B.L. D.
Breakfast on the train, then arrive Luxor where you will be met by our representative. Transfer to the ship. Embarkation, Lunch, Then Visit Luxor Temples and Karnak temples. Starting by the Avenue of Sphinxes visit the Unfinished Propylon, the Hypostyle Hall with it's 134 gigantic columns, the Obelisks of Queen Hatshepsute and Tutomosis III, the temple of Amon adorned with lotus and papyrus designs . Dinner and Overnight on board the ship. B. L.D. After Breakfast Visit the Valley of the Kings with their famous underground tombs from the 16th- 11th century B.C. ;the colossi of Memnon (The two colossi are made of sandstone, which during ancient times was brought from Gabal El Silselah. Each colossus, including the pedestal and the crown, is about 21m tall and represents King Amenhotep III seating on his throne. Continue to Hatshepsut temple once built by the female pharaoh who had to pretend she was a man. Lunch on board and sail to Edfu. Dinner overnight on board. Arrive Edfu. After breakfast visit Edfu Temple built in the Ptolemaic period. It was dedicated to Horus, represented as a falcon. It is one of the most beautiful Egyptian temples distinguished by its huge splendid structure that blends Pharaonic and Greek architecture. Lunch. Sail to Kom Ombo,arrive & visit Kom Ombo temple located in Kom Ombo town, 45 km north of Aswan. It is built on a hillside overlooking the Nile and was built for the worship of god Haroeris and Sobek, the crocodile god. It is noted for relief engravings on its walls which show ancient surgical tools, bone saws and dentistry tools. You can also see mummified crocodiles. Sail to Aswan. Afternoon Tea. Dinner and overnight on board. Arrive Aswan, shore excursion to visit Philae Temple (The Temple of Isis is one of the greatest Temples in Egypt and it occupies about a quarter of the island. It is the main Temple on the island, with its huge, complete, pylons and beautiful scenes), High Dam (One of the most outstanding architectural achievements of the twentieth century. It was constructed to replace the old Aswan dam built in 1902 to protect Egypt from the floods as well as providing irrigation and electricity all over Egypt.). Lunch. Continue to the Unfinished Obelisk, you can see innumerable inscriptions in the area around the quarries. Dinner and overnight on board. After breakfast Felucca ride passing by botanical gagarden and visit mausoleum of Aga khan, lunch, and then transfer to the railway station for an overnight train to Cairo. Dinner on tray on the train. Day 8 CAIRO: Breakfast on the train on tray served in the cabin. Arrive Cairo then Transfer to airport for final departure. End of services. Program can be modified. 02 Nights in SLEEPER TRAIN with dinner and breakfast served on trays in the cabin. Full Board starting with breakfast of day 2 and ending with the breakfast of day 8. All transfers on the road by coach for group and by private car for individuals.